Beth's Ruler Collection is dedicated to vintage rulers. This wonderful site belongs to a great recent buyer at my store. 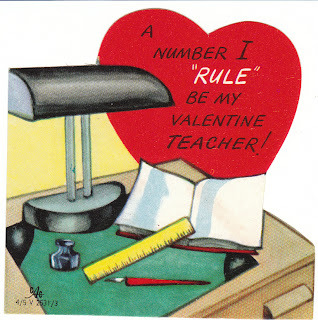 She bought the baby boomer vintage Valentine pictured here. (Note ruler, ink pen, and inkwell in the photo - on an old fashioned desk.) I enjoyed looking at the photos and reading more about the rulers. The 1920's vintage Molly Measure (children's ruler) that she has posted is just exceptional. It's also by Rust Craft - one of my favorite vintage card companies!